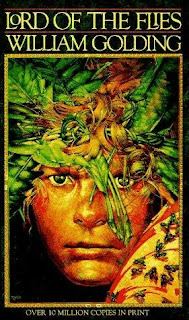 A Literary Odyssey: Book 30: Lord of the Flies. Interesting. I actually *chose* to read this one when I was in seventh grade. Granted, it was on the "acceptable choices" list but it wasn't truly assigned to me. And I absolutely loved it. I still have my copy. And I have tried to re-read it in later years (because seventh grade was a very long time ago for me) but have never been able to because the minute I open that first pag, I can still see the image at the end (I could be more specific but I won't ruin it for you). The book is truly horrifying but boy did it have sticking power for me so I guess I'd argue that I did "get it" even at that young age. I had to read it as a class assignment in high school. Most of the kids hated it, but I didn't. Even though it's really disturbing, I loved the way the author used words and his descriptions of the characters and setting were so vivid it really pulled me in. It's still one of my favorite books, for that reason. The real impact of the story didn't really sink in for me until I read it again later. Ice cream, that is cheap, FACT!